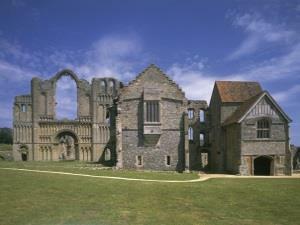 The dramatic and beautiful West Front was designed to emphasise the importance of the priory and it still impresses visitors today. Walk the ruins of the church including the Cloister and Chapter House before entering the Prior’s Lodgings and exploring the rooms inside. Enjoy the wonderful grounds as you pick your perfect picnic bench spot to stop for a bite with the gorgeous views of Castle Acre Priory for company. Let little ones run around and let off steam as there’s plenty of room in the grounds! Visit the stonework display in the Prior’s Lodgings and find out how churches were made in Norman times. Challenge yourself to have a go at the interactive exhibition to see if you have what it takes to be a medieval builder. Grab a trail leaflet and meet Brother Odo as he helps guide you round Castle Acre Priory then out into the village to explore the Bailey Gate and Castle Acre Castle, both English Heritage free sites. Castle Acre was an important medieval village and this trail helps you imagine all the different jobs people did back then – whether they worked, fought or prayed. Last admission one hour before closing. Check English Heritage web site before travelling. From King's Lynn station it is 20 miles to Castle Acre Priory. Take either X1, 12A or 32 from the station. 48 or 68 minute journey plus 5 minute walk.